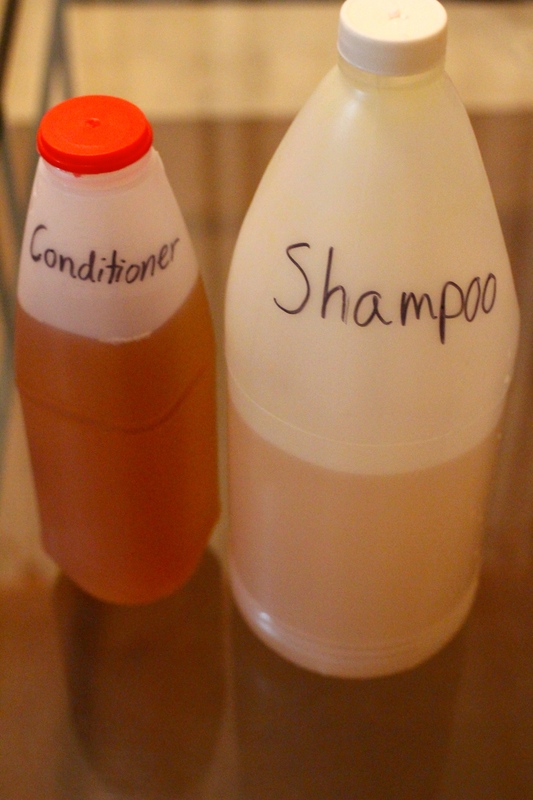 While I give it a fair trial, I’m putting my no-poo shampoo into these reused bottles I got from my local market. If it works out I will find squeeze bottles to use. The two other “What I Miss From the US” posts are, here about coconut milk, and here about laundry detergent. I’ve gone to 3 different grocery stores specifically looking for shampoo. One of which was the largest grocery store in town, another was a shop with a lot of imported stuff, and the last was a pharmacy. I’ve also gone to a few expat imported stuff stores. I’ve even gone to the local outdoor market where I can normally find hard to get items. None of those stores and markets had shampoo or conditioner! I’m not talking brands I like. I mean, they didn’t have any shampoo or conditioner…at all. That isn’t to say that there aren’t stores that might have it one day, but when they do have shampoo, you will see a line out the door and around the corner, with people waiting in the 95F+ degree heat. I don’t have that kind of patience. The thing about living in this wonderful tropical environment is that it is sunny every day. And HOT. If I have duty outside (which I do 4 times a week for10 min each time) then I will sweat. My hair will then get oily. So while, I could go a couple days without washing my hair and be fine in Portland, it is rarely the case here. So what is a girl to do without shampoo? I haven’t completely come to the point where I have no shampoo, because I was a bit of a hoarder last year (rightfully so considering the situation I’m in now), but I only have one bottle left. I am starting to experiment. Talk about jumping in to the deep end! The other day I tried to just rinse off my hair instead of washing it. It stayed tangle free and still smelled fine, but was kinda limp and still oily by the end of the day. I’ve read that after you use the baking soda/apple cider vinegar for a while that some people can do this. I’m not there yet! I have wavy/curly hair and I read that people use this method with success. I have about four bottles of conditioner left (not sure why I have that but not shampoo) so I would love it if I could use this option. I got my hair wet and used the conditioner and tried to do an extra thorough job of rinsing it out. For some reason my hair felt heavy all day and greasy by the time 5PM came along. Next time if I tried it I would keep some dry shampoo handy. I’ve tried dry shampoo before on days that I try to skip washing my hair and it works for me until about mid afternoon. While it looks fine, my hair never feels clean. I will save this for my backpacking trip or perhaps for weekend usage. One thing that I’m so excited to find in my local markets are fresh herbs! Rosemary is supposed to be great for dark hair too. I haven’t tried this herbal shampoo recipe because I can’t find castile soap or essential oils here in Venezuela, but if I can, I would love to give it a try. I’m going to try to remember to look for these things in Peru and Bolivia while backpacking this December and I will post an update if I find some! This coconut and honey recipe sounds good to me because both of these are creamy and not as acidic as the baking soda, but I haven’t found a hammer and screwdriver to crack coconuts so that I can make coconut milk. Here is the recipe I found online. If all else fails I will do like many of the locals: go to the hair salon when I want to do my hair! So as you see, I haven’t found the perfect answer, but I’m trying to work toward making do without shampoo and conditioner. Please comment! Are you using an alternative shampoo and conditioner? Please share recipes and/or links with methods you like for alternative hair care. Amanda, you don’t need to wash your hair that much! but, to help you; there is a make-up store in Sambil. I bought body wash, face cleanser and shampoo and conditioner. All name brand and slightly expensive. I promise it was wroth the money. Let me know when you want to go. I try to work out most days, and if I do anything in Venezuela more strenuous than I slow walk I will start sweating! If I have sweaty hair then I want to wash it. The good thing about the gradual no-poo method that I’m using is that I am still using regular shampoo and conditioner twice a week. So five days a week I’m using baking soda and water to clean my hair, apple cider vinegar to condition it, and some Argan oil to style and prevent dryness. Since I actually wrote this post a week ago, I have since found some imported Brazilian shampoo at one of the Chinese shops around town. I might still check out the beauty store in Sambil though! Hi! Thanks for visiting. I actually wrote this article over a week ago, so I am in my second week of no-poo. I’m slowly working up to going cold-turkey because I was shampooing my hair everyday and my hair is really oily if I don’t use traditional shampoo. So far I have only shampooed twice since I started on the 6th. So far my hair is feeling better and better everyday. Thanks for the other link about no-poo. She has a lot of info! Yikes. I hate the shampoo and conditioners here because they absolutely ruin the way my hair looks but I’ll never complain about them again. I can’t imagine what it’s like going without either of them. This has definitely made me more grateful for what I do have.